We are pleased to announce this year’s winner of the Ernest Davies Award for Advancing Parking Knowledge is Wasiu Seriki. His winning entry was entitled An Open Market and featured in October’s issue of Parking News in 2011. Runners up were Helen Dolphin for her article Bill to Scotch Pavement Parking and Alasdair MacMillan for his article ‘How long does it take to find a parking space’? A biography of Ernest Davies :- Ernest Davies was a founder member of the BPA and served as Treasurer and Secretary in its first few years, and was President for 3 years up to 1979. He was a journalist by profession, and was publisher and editor of Traffic Engineering and Control. He also had a significant career as a politician, having entered parliament in 1945 and eventually becoming a junior minister. He died in 1991. 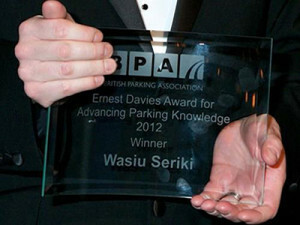 The winner was announced at the 2012 BPA Members’ Dinner, which took place on 29th November at Drapers’ Hall in London. The dinner is set in stunning surroundings as members have the opportunity to network with colleague and enjoy speeches from the BPA President, Anjna Patel and this year’s guest speaker, Dr Phil Hammond. Congratulations to the winners of the charity raffle which raised money for the President’s charity, Parasol Charity. We would like to thank our sponsors Marston Group and Netsize for kindly donating fantastic prizes – a hamper and Samsung Galaxy smart phone respectively. Complete Parking Services (CPS) Ltd (RC: 1104178) 5th Floor Mulliner Towers, (Former NNPC Building), 38 Alfred Rewane Road, Ikoyi-Lagos, Nigeria.